So far we’ve covered Sabyasachi Lehenga Prices, Sabyasachi Saree Costs. I thought some of you might be interested in knowing what does Sabyasachi Menswear Sherwani Cost? Depending for the occasion you’re shopping, Sabyasachi Menswear Sherwani Cost can range between INR 40,000 to INR 4 Lakhs. A lot of Sabyasachi Brides tend to coordinate their looks with their grooms. I mean every bride does that. But what I mean is, a Sabyasachi bride is often standing next to a Sabyasachi groom, and sometimes wearing Sabyasachi jewellery. It’s like a complete package deal. What you must know is Sabyasachi Menswear Sherwani Cost’s comparatively lesser than a bridal lehenga. Like significantly lesser. Come to think of it, I can’t imagine a bride letting go of a Sabyasachi lehenga and let her groom wear a Sabyasachi Sherwani just coz of the price. But still. In case, you want to know what the wedding and pre-wedding sherwanis cost, here goes. While researching about this post, I casually posted a poll on Frugal2Fab Instagram Stories asking if you’d like to see this post. Around 50% of you’ll said yes. But a whole lot still wanted to see Sabyasachi Lehengas. I mean I understand, who doesn’t want to see those. So I am going to be sharing matchy-matchy Sabyasachi bridal lehengas so you know which one goes with what. Obviously, there is no rule as such. You can totally mix and match the style. Surprisingly, I don’t recall seeing any bride wear this particular lehenga. Maybe they have, but on Instagram, I don’t think I’ve seen it. 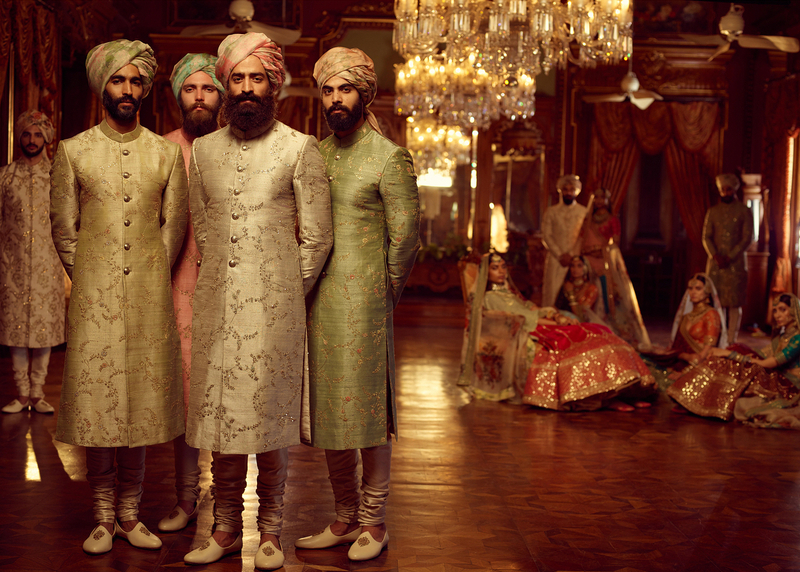 As per the Sabyasachi sherwani, honestly, I don’t really notice menswear all that much. But I’m sure if you’re a bride to be, you have plenty interest in seeing these designs. This particular lehenga price is not yet out, but I’m so so interested to find that out. Will update it whenever I have the information. Remember the time Deepika Padukone & Ranveer Singh got married? It’s the same lehenga featured in the picture. Well, this set of sherwani and (dresses angrakha? Is that what it’s called) are from last years 2018 wedding collection. The colours are nice bold pop pinks, that you can easily wear with any of the Sabyasachi bridal lehengas. This sherwani is also one of the more (expensive) pieces from what I’ve understood about Sabyasachi Menswear Sherwani Cost. With more and more people opening up to the idea of experimental menswear and gender fluid fashion, it becomes easier as a designer to help men express themselves without inhibition. Bright colours, exuberant prints and exaggerated silhouettes are terms that can no longer be attributed only to women’s clothing. The gentlemen wear ​a quilted silk sherwani and printed cotton angrakha, both in rose-madder coromandel chintz and paired with Kota leheriya safas. Whether you opt for sarees or lehengas, an ivory classic Sabyasachi sherwani will look good with everything. If you get a chance, browse through the old Sabyasachi collections. He has showcased a number of ways to style an ivory sherwani with different style outfits in his collections. I am just sharing some of my favourites here.